Today, Bob Dylan fans got an early taste of the artists upcoming LP, Together Through Life, by way of a free MP3 off his site. This is Dylan’s 46th release. 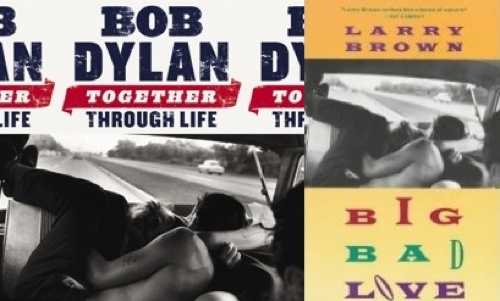 Fellow Larry Brown enthusiasts may have noticed that the image used on the cover of Dylan’s upcoming album was also used on the cover of Brown’s 1990 book of short stories Big Bad Love (a great read by the way). You may also remember that 2006’s Modern Times cover art used the same image as the back of Luna’s Penthouse LP. Together Through Life drops April 28th. **The cover image on Together Through Life is by Bruce Davidson (from “Brooklyn Gang”); the image on Modern Times is by Ted Croner. + Download digital music via eMusic’s no risk 25 Free MP3 trial offer. Artists change and Dylan is one of the best. He’s been drinking burbon and hanging out in sweaty bars. Good boy. This sounds good. Speaking of the late Larry Brown, the film adaptation of one of the short stories in that collection, titled Big Bad Love after the collection, is a pretty good film in its own right and worth seeing. Plus it has Tom Waits on the soundtrack. See? We all move in circles. this song is extremely cool. really excited about the new album!!! This is a serious *jam*! A bit more on j.neas’ reference to the film of Big Bad Love – it’s an excellent work of art by actor/directo Howard Arliss, and the soundtrack features some excellent contemporary delta blues by RL Burnside, T-Model Ford, Kenny Borwn, and Junior Kimbrough. Plus tunes by Tom Verlaine, Steve Earle, and the aformentioned Mr. Waits. Burnside’s take on Dylan’s Everything’s Broken serves the song well. This is a great movie filled with extraordinary music, where the tunes are an essential part of the film’s sound and feel. Arliss channel’s Brown with gritty, slightly surrealistic urgency that creates a swampy delta darkness. Not to be missed. reminds me of waits’ version of the Wire theme song. The guitar sounds a bit like Marc Ribot. I think thats where a lot of people are getting the Waits comparison. Let’s give credit where credit is due. The cover image on the new one is by Bruce Davidson (from “Brooklyn Gang”); the one on Modern Times by Ted Croner. Sluggo, thanks – updating the info now! Sounds pretty cool, and i’ll definitely be getting the album on its release, but I still want to hear another full blown ‘folk’ album akin to his early work. I have doubts that this will ever happen now though.